Tell us about the roles and responsibilities of the lead staff at your facility. The lead staff at Our Lady of Lourdes Medical Center includes our surgeon and chief of bariatric surgery, Dr. Gus J. Slotman. Dr. Slotman has eight years of bariatric surgical experience and has completed over 700 bariatric procedures. The nurse manager of a 40-bed medical surgical unit and bariatric program coordinator, Jason Mejzak, RN, BSN, CMSRN, CBN, provides all staff education and is responsible for clinical leadership, as well as budgetary responsibilities. Clinical Coordinator Lisa Shaw, RN, CMSRN, CBN, provides leadership in the daily care of bariatric patients and oversees the entire patient experience at the medical center. The staff comprises 48 registered nurses and 12 nursing assistants on the bariatric nursing unit, all of which are trained in the care of the bariatric population. Performance improvement for the bariatric program is led by Marie McMillan, RN, who has extensive operating room experience and was instrumental in assisting with program development. The staff at Lourdes Medical Associates consists of Karen Orlando, a full time scheduling coordinator and office manager, and Shirley Muller, the intake coordinator. What size is your facility? Our Lady of Lourdes Medical Center is a regional referral center in Camden, New Jersey, that is known for providing the most sophisticated levels of care. For more than five decades, the medical center has been committed to enhancing the health and wellbeing of southern New Jersey’s residents, particularly those most in need. The 410-bed teaching hospital offers many specialty services, including the New Jersey Heart Institute at Lourdes, one of the largest providers of cardiac services in the Delaware Valley; the Regional Perinatal Center for high-risk mothers and infants; the Lourdes Regional Rehabilitation Center; the Southern New Jersey Regional Dialysis Center; and the Center for Organ Transplantation, the only hospital in the state approved to perform kidney, pancreas, and liver transplants. In addition, our surgical program includes bariatric and robotic services. In 2005, Lourdes opened the Pavilion, a $54 million expansion that features a new emergency department, operating suites, patient rooms, and a new home for the Our Lady of Lourdes School of Nursing. The Lourdes Wellness Center in Collingswood is a leader in integrative and holistic services, combining mainstream medicine, alternative therapies, and spirituality to enhance a healthy lifestyle. Programs include community health education and wellness, integrative family medicine, and the Lourdes Institute of Wholistic Studies. Our Lady of Lourdes is also recognized by the American Hospital Association as a national leader in the provision of community outreach services. These award-winning programs include the Osborn Family Health Center, a primary care clinic located in Camden, Project H.O.P.E., a homeless outreach program, and The Bridge, a peer support program for teenagers. Our Lady of Lourdes Medical Center is part of the Lourdes Health System and is sponsored by the Franciscan Sisters of Allegany, New York. Lourdes is a member of Catholic Health East, a health system with 31 hospitals on the East Coast. What is the number of patients treated at your facility on an annual basis? Our Lady of Lourdes Medical Center treats an average of 145 patients for gastric bypass surgery. Named New Horizons Bariatric Weight Loss Program, our program here at Our Lady of Lourdes Medical Center was started in 2003, and we have treated over 500 patients. We chose New Horizons as the name of our program because once our patients have the surgery, they have a new horizon in front of them for a healthier life. The majority of patients that are treated through our program are Caucasian women with a mean age of 43 years. Was it difficult attaining the SRC Center of Excellence designation with the size of your facility, patient volume, and with one surgeon? Yes and no. The criteria set forth by the Surgical Review Corporation SRC) were implemented to ensure patient safety. Our focus at the medical center is to provide safe patient care that allows a patient to receive optimal outcomes. Since we only have one surgeon, this allows us to have a consistent plan of care and has enhanced communication between the surgeon and the nursing staff. But there is some difficulty in continuing to have the volumes that are required to meet the criteria for us to continue to be certified. Does your center have one particular area of expertise? Our Lady of Lourdes Medical Center considers patients receiving bariatric surgery as comprising a special high risk group of patients with challenging physical, medical, and psychological characteristics. In order to provide for optimal outcomes, these patients are not treated as routine general surgery patients. Our surgeon performs open gastric bypass with the Roux-en-Y procedure. Please give a general synopsis of how your patients are treated while under the care of your center. The program incorporates both inpatient and outpatient care on a multidisciplinary basis. The patients are required to take careful steps to ensure that they are aware of the inherent risks of the procedure. Inpatient care is provided once the patient has completed the surgery and he or she is cleared to be transferred to the bariatric specialty unit. The bariatric nurses and nursing assistants are trained in the care of bariatric patients, are aware of all protocols, and follow a specific care map. The unit focuses on early ambulation and pain management as soon as the patient is transferred to the unit and starts to begin the education process. The patient is then followed throughout his or her stay at the medical center by a team of medical staff including surgery, nursing, dietary, physical therapy, anesthesia, and holistic nursing, as well as any other specialists that need to be consulted. What are some of the new technologies, equipment, devices, and products introduced at your facility that have been really beneficial to your practice? We have several vendors that consistently educate the staff on new products and are continually looking to improve the patient’s experience. We also look at products that help keep our employees free from injury. One piece of equipment we use in the operating room is the HoverMatt, made by HoverTech International, which is a mattress placed on the operating room table. The mattress is inflated once the surgery is completed on the patient, which allows easy movement and assists in the transfer of the patient from table to bed. We are also in the process testing different compression boots made by several different manufacturers. Compression boots are beneficial in decreasing the chance of our patients developing deep vein thrombosis. Recently, we began using the Barton 3000, a special chair for our bariatric patients that has extra padding, which allows patients to sit for longer periods of time, decreasing the chance of our patients developing pneumonia. The head and arms of the chair adjust for patients of all sizes, and the chair can also recline into a stretcher. Who handles your scheduling? How do you handle physician timelines? Karen Orlando, scheduling coordinator and office manager, does all scheduling for the bariatric program with assistance from Vyne Lewis, operating room informational specialist for Our Lady of Lourdes Medical Center. Vyne uses ORSOS (Operating Room Scheduling Office System) to make sure that all physician timelines are accomplished. The system uses a mathematical formula that takes the last 12 surgeries and removes the longest and shortest, then calculates how much time each surgeon will need to block time in the operating room. We also use crystal report writing to track how many surgeries we have completed and to maintain communication between disciplines regarding when patients are scheduled to have surgery. How is inventory managed in your facility? Who handles the purchasing of equipment and supplies? Lisa Shaw, the clinical coordinator, sends a purchase order to Eileen Moffitt, our network administrator, who assigns a specific number and sends it via e-mail to the vendor, and the equipment is then delivered. Associates on the bariatric specialty unit are educated through inservices on all equipment and are aware of how to order equipment when the management team is unavailable. When a patient is discharged, we then call the company, who removes and cleans the equipment so that it is ready for the next patient. How has managed care affected your facility and the care that it provides patients? Our medical center was in a unique situation since we had started the process of becoming certified by the SRC. The new requirements from CMS, which state that only centers that are certified are allowed to recieve reinbursment, did not affect the care of our patients. We are fully accredited, and therefore have not had any patient scheduling difficulties. Dr. Slotman’s office does careful screening of all applicants and reviews the stringent requirements by each insurance company before patients begin the process. What measures has your facility implemented in order to cut or contain costs and improve efficiency? The medical center continues to look at cost effective ways to manage patients and maintain the high quality of care they receive. The care map that we use has assisted the nursing staff with having a daily plan for patient progress that has helped shorten length of stay to only 3.1 days. Also, our bariatric surgeon has a dedicated operating room team to reduce operating room time. We continue to evaluate and purchase new equipment to reduce the cost of rental equipment. We also make sure that our therapy department is involved with education to reduce the number of injuries from patient transfers. How does your facility deal with the issue of patient safety and staff safety? Do you have a certain protocol for lift and transfer, for example? Safety is an important priority that we practice every day on each individual patient. Education is our primary resource for maintaining patient and staff safety. The staff attends educational inservices on proper body mechanics and proper use of all new equipment. Our protocol consists of the use of a team to perform transfers and, if further assistance is needed, the team calls security to assist. Patients who are unable to move themselves are not transferred until the team is in place. The team also utilizes an automatic patient lift device for patients unable to assist with their own transfers. Physical therapy is also implemented with all patients. How are new employees oriented and trained at your facility? New employees attend a seven-day hospital orientation and a seven-week orientation on the nursing unit. During their orientation, they are under the direct supervision of a registered nurse who is specially trained as a bariatric nurse and preceptor. Hospital orientation includes education on all policies and all emergency procedures in the medical center. Once an employee is on the bariatric specialty unit, he or she must review all educational material on care of the bariatric patient, and a copy of the care map is provided for review. New associates then attend one of the preoperative patient education classes, where the entire length of stay and expected outcomes are reviewed. Upon completion of all educational materials, they are allowed to attend one surgery in the operating room with Dr. Slotman. Prior to taking care of a bariatric patient, the new associate must pass an examination on care of the bariatric patient with a score of 100 percent. What are the strategies for retaining and motivating staff? Both staff involvement in education classes and allowing associates to view the surgery have proven to be great tools in retention. Applying and receiving the Bariatric Center of Excellence distinction has demonstrated to our associates what an amazing job they do in caring for this special population. For continuing education, we produce monthly articles on bariatric care and trends within the field. 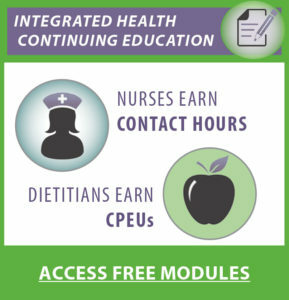 The hospital also offers each associate $250 to obtain continuing education credits and has free online education for credits available to all associates. We also encourage associates to attend relevant medical conferences. Please describe your patient education program. Patient education begins at the point of first patient contact with the program and continues throughout the entire course of care. During the first call to the bariatric physician’s office, a brief medical history is gathered and an overview of the program is provided. Patients are also advised to contact their health insurer to ascertain whether gastric bypass is a covered benefit and to what extent they would accrue a financial liability. During the first office visit, each patient is seen by the bariatric surgeon, who takes a detailed medical history and performs a physician exam. Information about the surgery is explained in detail, including the method used by the surgeon, risks and potential complications, the regimen to be followed prior to surgery, and what to expect during surgery and recovery. It generally takes 2 to 3 months for the average patient to complete preparation for surgery. Throughout the process, great care is taken to ensure that the patient understands not only the nature of the surgery, but also the ramifications it will have on future lifestyle and health. Surgery is not scheduled until after informed consent is documented. Education continues at the medical center, where all patients are required to attend nutrition classes, a preoperative education class, and a tour of the nursing unit. Patients at this session also receive education from our holistic nurse on relaxation techniques, visualization, and emotional support, and they also review healing statements and receive a relaxation CD to listen to at home and at the hospital. What types of patient support groups are offered at your facility? Our support groups are all run by the Lourdes Wellness Center, which has many offerings for our patients. Stepping Stones is a free support group provided for preoperative patients every second Tuesday and for postoperative patients every third Tuesday. We also offer individual nutrition education sessions and behavior modification education for gastric bypass patients. What long-term follow-up measures are practiced at your facility? The Medical Center currently collects and analyzes data using Microsoft Excel spreadsheets. Data is gleaned from charts and other clinical and financial reports that, in accordance with performance benchmarks and data points, are required by various internal and external oversight bodies. These entities include external bodies, such as JCAHO, New Jersey Department of Health and Human Services, University of Medicine and Dentistry of New Jersey (UMDNJ), and Catholic Health East, the larger health system with which Our Lady of Lourdes works. • Weight loss, BMI, vital signs, and lab results are analyzed and noted. • Patient adherence with diet and exercise is explored. • A physical exam is performed by the surgeon. • A prescription for lab work (CBC, comprehensive metabolic panel, Ca++, Mg++, iron, folic acid, and prealbumin levels) is given (with any abnormal results followed up with the patient and primary care physician). • Patients are told to contact the office if they begin to experience any problems. If a problem appears to be severe, patients are advised to go to the emergency room. • Regular exercise is reinforced. • Patients are encouraged to participate in psychosocial support groups. • A 12-month follow-up visit is scheduled. Our goal is to make healthcare available to all of our patients, and we attempt 100-percent patient follow-up for five years. We do lose patients that relocate and are nonadherent with the program’s wishes. What quality control measures are practiced in your facility? We have a performance improvement nurse that does 100-percent chart reviews on all bariatric patients and reviews any core complications. The data is then reported to the department of surgery committee, which meets quarterly, reviews any complications, and ensures that we are achieving our quality outcomes. Finally, all data is submitted to the board of trustees. What makes your facility unique? We are a faith-based organization that follows our mission, vision, and values and prides itself on community education for all of our programs. We spend the individual time with each of our patients and make sure that they are ready to successfully and safely lose weight. Since we began performing bariatric surgery three years ago, we have not had any employee injuries, which is attributable to the medical center for supplying the unit with safe equipment and proper education. Our holistic nurse, Coleen Naylor, RN, provides patients with alternatives therapies for pain control and faster healing, both of which assist the facility in containing costs. The New Horizons program care map and preoperative education classes have also streamlined patient care so that all associates and patients are aware of the care plan. What efforts do you make to maintain HIPPA compliance? The medical center uses pass codes. A pass code is a code that allows each individual patient the option to have outside members of their family receive information. The patient can give this code to his or her family members, and when they call or visit they give the nurse the pass code, and the nurse is then allowed to give the family the patient’s medical information. We also have all associates sign a yearly computer information confidentiality statement that states they will not discuss any patient information and will not use the computer to get any patient information unless they are caring for the patient. do you have any reports of absorption problems with medications after bariatric surgery? my daughter had gastric by pass 10 years ago and seems to have problems absorbing certain medications. also, can she join the post op support group if she didn’t have surgery at Lourdes?